Disclosure: This post has been created in partnership with the Dairy Farmers of Canada. All opinions on this blog are my own. Around this time of year, many Canadians can look forward to the free delivery of Dairy Farmers of Canada’s iconic Milk Calendar. It’s been around for 41 years – longer than I’ve been alive! I always get excited when I see its arrival in my local newspaper. Over 2 million Canadian households in Ontario and Atlantic Canada have received the calendar already. Not only does it help me keep track of important dates and appointments, but it’s also a source of fantastic recipes. I’ve tried many recipes over the years from the Milk Calendar and have always been impressed with the quality. The 2018 Milk Calendar is packed full of nutritious and simple recipes – 19 in total! All the recipes feature ingredients made with 100% Canadian milk and celebrate local, sustainable, handcrafted foods. You’ll also find food pairing ideas and entertaining tips and tricks. I’m glad they delivered it in November because I found a few recipes I want to try for the holidays including this mouthwatering Festive Seafood Pizza. This year’s recipes were developed by Heather Trim, an accomplished food writer and recipe developer. After browsing through the Milk Calendar, I’m excited to try several of them. I love that they are healthy and made with quality ingredients that I know my family will eat and enjoy. 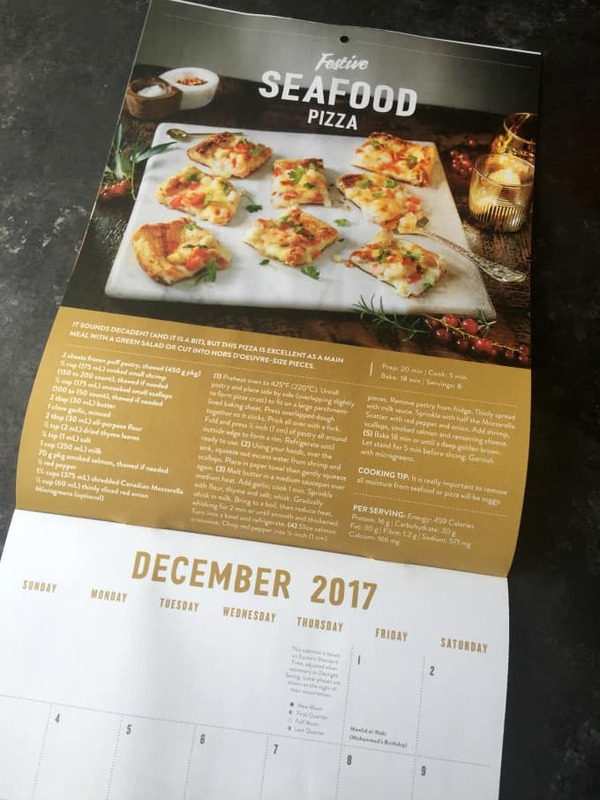 The December 2017 recipe is a Festive Seafood Pizza. 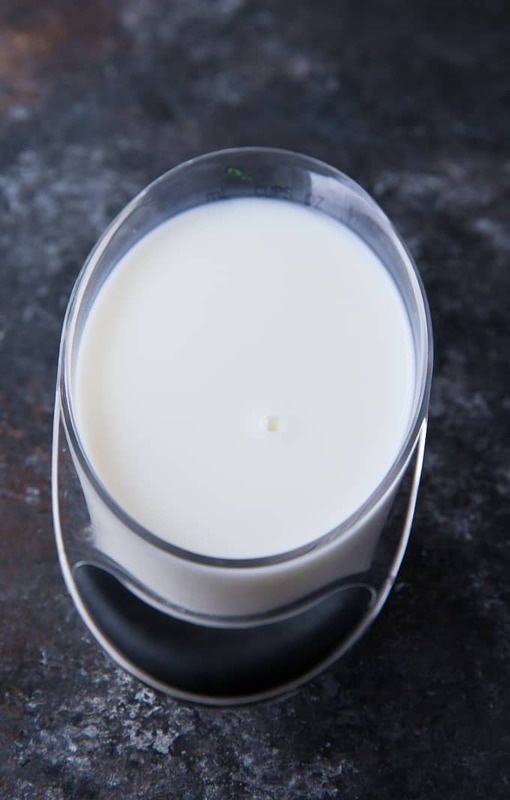 I put it to the test recently in my home and was WOW-ed by the results. 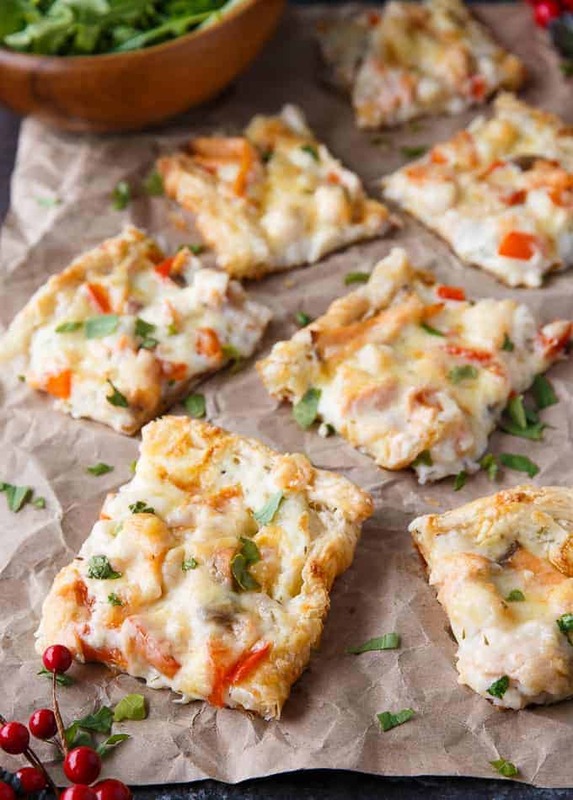 It’s a bit of a twist on a typical pizza, but a delicious one. It may look like it has a lot of ingredients, but it doesn’t take long to make. You can’t have a pizza without loads of ooey gooey cheese! 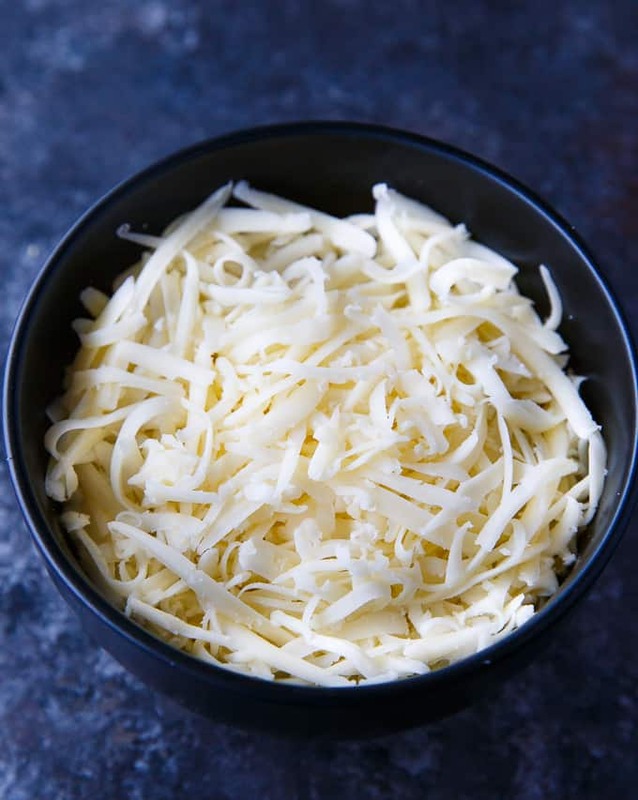 This recipe is made with shredded Canadian mozzarella – an ingredient we always have on hand here. My family loves cheese both as a quick snack and in meals as an ingredient. 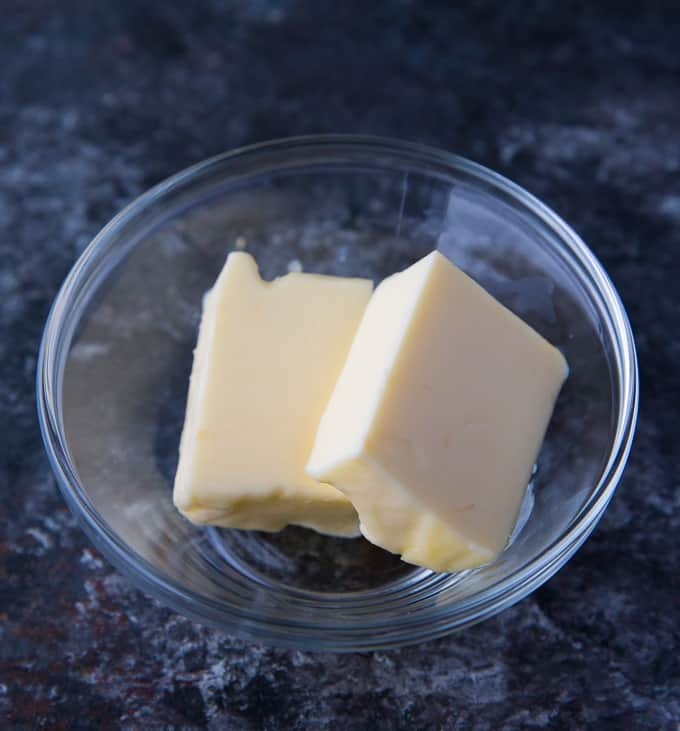 It also includes butter – it’s used to make the roux for the creamy milk sauce. Instead of a tomato based sauce, this pizza has a creamy, flavourful milk sauce made with 100% Canadian milk. My daughter drinks milk like it’s going out of style and I had to tell her to save me some so I’d have enough to make this recipe! I had to show you a photo of what the creamy sauce looks like because you can’t really see it on the bottom layer of the final photos. It’s so smooth and practically melts in your mouth. It pairs perfectly with the flavours of the seafood. This recipe is great for the kids to help you make. 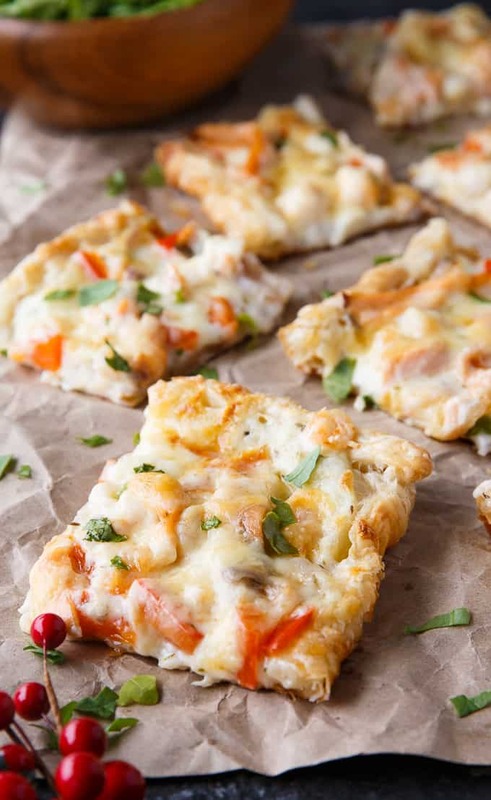 The crust is made with frozen puff pastry which is easy to work with and gives the pizza a delicious, homemade taste. Kids love to help add the toppings. I often bring my youngest daughter into the kitchen with me when I’m cooking. I can share tips with her and hopefully, get her to fall in love with cooking like I have. Plus, she is more apt to try a recipe with new ingredients when she has been involved in the preparation. Surprisingly, she liked this pizza even though she isn’t a huge seafood fan. I think all that yummy cheese and sauce helped! I like that this recipe is versatile. It can be served as a main course with a green salad for your supper or as an appetizer, cut into small pieces, for a holiday gathering. Either way, it will be gobbled up in a flash! I’ve never added seafood to a pizza before. 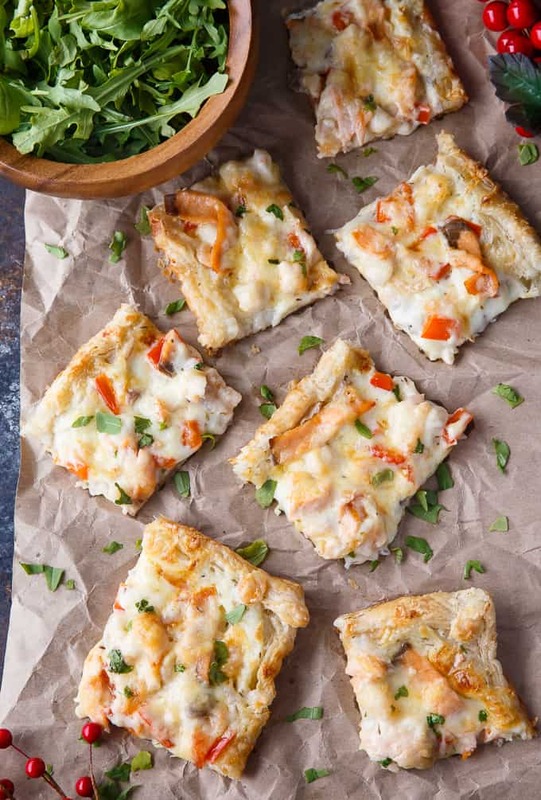 This recipe has three yummy varieties – smoked salmon, shrimp and scallops. It’s a delicious twist on a classic. 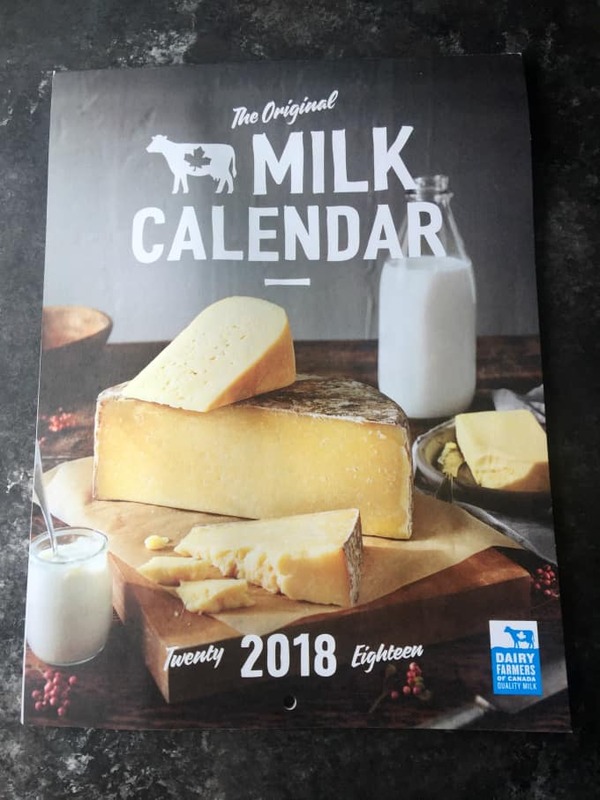 I’ll be putting the Milk Calendar up on my fridge and plan to make December’s recipe again. I have a few parties planned for the holidays and think my friends and family will be impressed by my culinary skills. Thanks Dairy Farmers of Canada! Visit milkcalendar.ca to find out how to get your copy of the Milk Calendar and to discover more yummy recipes to try. They also feature videos and cooking tips and tricks! Did you get your copy of the Milk Calendar? If so, what recipe are you looking forward to trying? Connect with the Dairy Farmers of Canada on Facebook and Instagram. That’s the best pizza recipe I’ve ever seen. I love pizza and I LOVE seafood. This wins the internet for the foreseeable future. Om nom nom. OMG, those flavors are calling my name. They’re saying, “Colleen. Make me and put me directly into your belly!” That looks so good! I’m not big on seafood….but THIS looks INCREDIBLE! You may have just changed me to a seafood fan! That looks absolutely AH-mazing!! We are actually doing pizza this week and I think I am going to try this one. We are hosting Christmas dinner at my house and I have been looking for awesome apps that I can put out for my guests. I am totally making some of this pizza for them. Seafood pizza…hmm… Not something I’ve thought of before. But, it looks really yummy. This looks like an amazing dish to take to a party! I love seafood and I bet the flavor combo is totally delish. 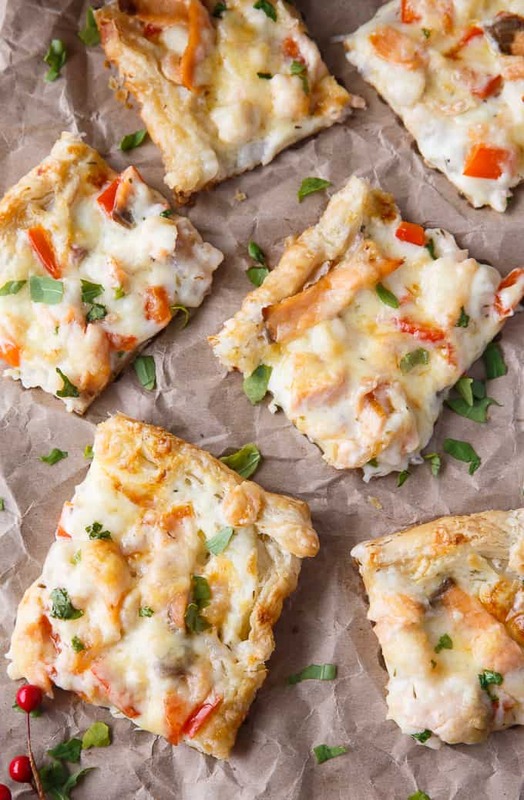 Seafood pizza sounds darn good! I would love to enjoy some about now! I am totally hungry! This looks so yummy! It would be great for a NYE party at home (if you have the kids). Pepperoni for them and the fancy Seafood Pizza for mom and dad! I’m not a big fan of seafood, but this looks good. I may have to give this a try. I’m sure it will taste amazing! I have never tried seafood pizza before. It looks so delicious. I am excited to give this recipe a try. The Milk Calendar is my favorite every year. That is such a fun recipe! It’s awesome that this came in the calendar! I’d be excited to see all of the recipes included. Pizza is definitely one of our favorites. 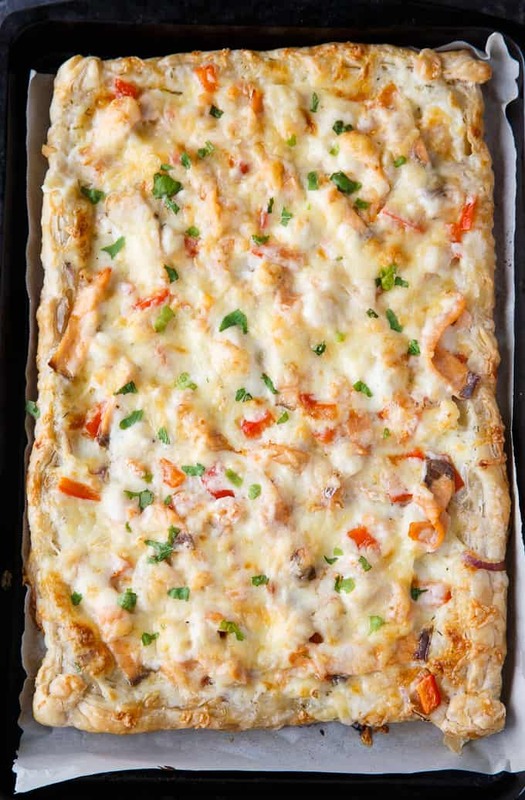 This seafood pizza would really be a hit! This looks so good! I love that it is fairly simple to pull together, but still looks fancy. YUM!! my husband would totally get a kick out of this! seafood on anything is his style! We love seafood! No doubt this will be a huge hit for my family! This sounds delicious! What a neat take on pizza. I am going to have to try this sometime soon. 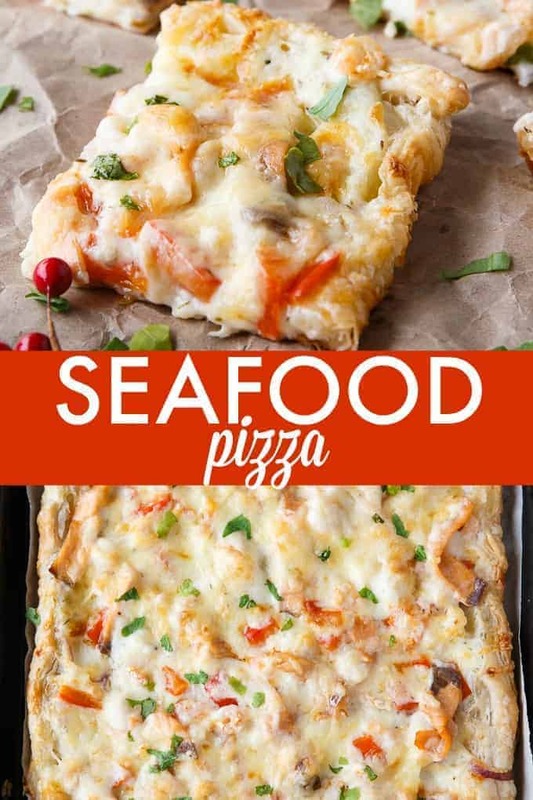 I’ve never thought of a seafood pizza before but it looks delicious! 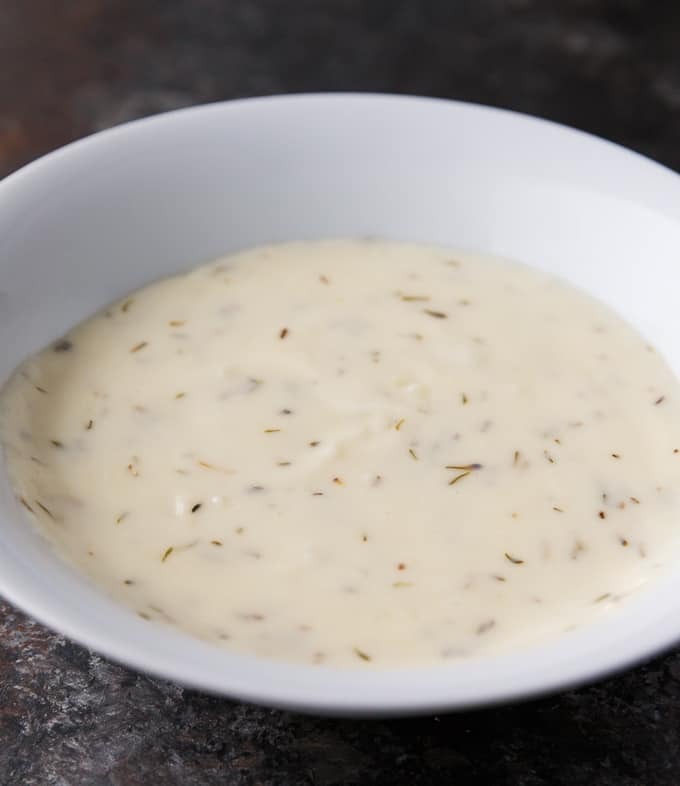 Thanks for showing the pic of the creamy sauce because you’re right about not being able to see just how creamy and wonderful it is! Looks delicious! I’ll have try this in a gluten-free version and let you know how it tastes! Thanks for sharing on Happiness is Homemade! This pizza will be great for our Friday Night Pizza Party! Hope you have a great week and thanks so much for sharing with us at Full Plate Thursday. 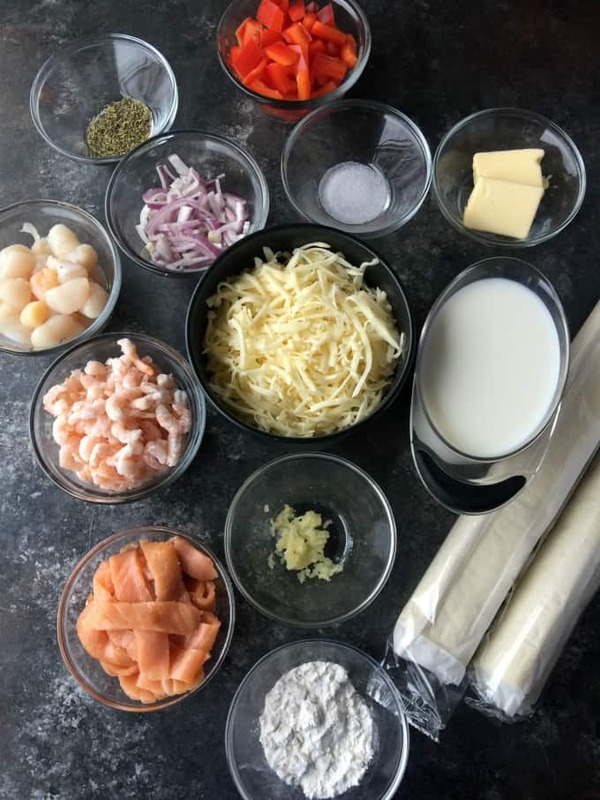 I don’t often put seafood on my pizza but this recipe tells me I should! It looks amazing! Also, it’s my 3rd year getting the Milk Calendar, and I love it too! The recipes in them always look amazing.